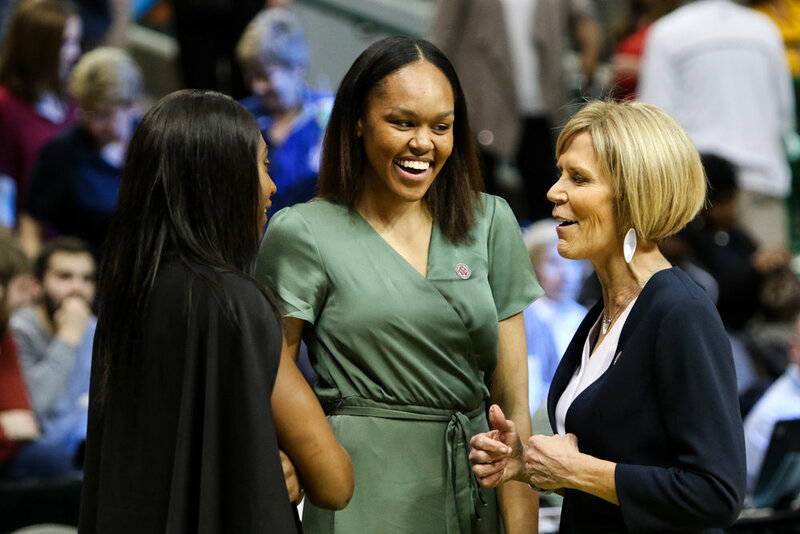 DALLAS— Azurá Stevens and Batouly Camara may not have played a minute for the UConn women’s basketball team this past season, but make no mistake; they’re as big a part of the team as any starter, coach or bench player. Stevens, who transferred from Duke after two seasons, and Camara, who transferred after her freshman year at Kentucky, came to UConn shortly after the program’s 11th national championship. Due to NCAA transfer rules, the two sat out the 2016-17 but were still able to practice with the team. These same NCAA restrictions prohibit Camara and Stevens to travel with the team. So when the Huskies clinched their spot at the Final Four in Dallas, Stevens and Camara could only make the trip if they booked their own flights and paid their own way. The decision was a no-brainer. For Camara, that meant a bus from Hartford to New York City and another bus from the city to LaGuardia before flying in to Dallas. For Stevens, it meant driving to Boston and flying out of Logan Airport. Both routes were certainly more roundabout than the charter flight from Connecticut’s Bradley Airport that the rest of the team took, but Camara and Stevens didn’t care. They just wanted to support their teammates. That support was needed after the Huskies’ Final Four loss to Mississippi State at the hands of Morgan William’s overtime buzzer-beater. Due to the UConn historic 111-game win streak, not many players had experienced a loss at the college level. However, it’s something Stevens and Camara are somewhat familiar with due to their time at their previous schools. While the upset loss stopped the Huskies short of their goal of a fifth-straight national title, it just made the two transfers’ desire to get out on the court and compete even stronger. Camara, a 6-foot-2 forward from New York City, will have three years of eligibility remaining and will immediately add more frontcourt depth off the bench. In her season at Kentucky, she showed her ability to compete at the game’s highest level, posting a career-high 14 points against South Carolina on Feb. 4 and hauling in 14 rebounds in an earlier matchup against the Gamecocks on Jan. 14. Stevens, who averaged 18.9 points and 9.6 rebounds in her sophomore season at Duke to earn honorable mention All-American honors, will likely slide right into the starting lineup next season. Her size, athleticism and skill makes UConn an even more dangerous team offensively and will help solve some of the rebounding issues that plagued the Huskies at times this season. “They have been a great part of our program. They are two personalities that I am really looking forward to having on the court with us. They bring different dimensions. I smile when I think of them,” Associate Head Coach Chris Dailey said. For a UConn team that is losing just one senior starter in Saniya Chong, the additions of Stevens, Camara and a talented freshmen class that includes No. 1 prospect Megan Walker has next season’s expectations higher than ever. After a supposed rebuilding year that saw this season’s team reach their 10th-straight Final Four, expectations for next year’s team are higher than ever. “We’ve worked really hard and I know we didn’t want to end on this note, especially for our seniors next year, we just really are making sure that we are prepared to the best of our ability before we step out on the court next year,” Stevens said.